If you’re expecting to be entertained in an Amusement Park way, then this tour is probably not for you. The Weta Cave Workshop Tour in Wellington consists of being guided through a number of work benches, past free-standing exhibits and examples of the computer technology used. Apparently, even after months of work, many Weta creations never see the light of day and are eventually stored in a warehouse somewhere. All riveting stuff for lovers of design, Hobbit and LOTR films and those interested in the special effects in films like Avatar. I was captivated by the behind-the-scenes anecdotes delivered in a fast patter by Emily, our tour guide and NO, this is NOT a photo of Emily but one of the trolls on exhibit and the only photo we were allowed to take before being ushered through the door of the actual visit Weta Cave Workshop Tour Wellington. In my opinion, this small group tour was greatly enhanced by the vivacious Emily and would have been less ‘colourful’ without her engaging personality. She made us laugh and boy, could she tell a good story. The work that goes into one piece of sleeve steel chain for a costume took three months of weaving…by hand, if you please! You’ll notice the occasional designer walking by and they all seemed to have the haunted look of the sleep deprived – 24/7 dedication here folks. Computer technology is extremely sophisticated and and it was fascinating to see how the computer images evolved to create the final product. This tour is extremely popular and we found it difficult to get a parking space, however with patient circling, you will find one eventually. I would definitely recommend the Weta Cave and Workshop Tour for travellers who appreciate the magic that can be achieved from those who dare to imagine without limits. 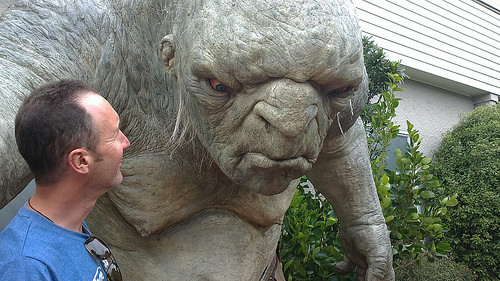 Opening hours to Visit the Weta Cave Workshop Tour Wellington is 9am to 5.30pm daily. Entry fee is NZ$20 per person (prices ex March 2014). Booking here.